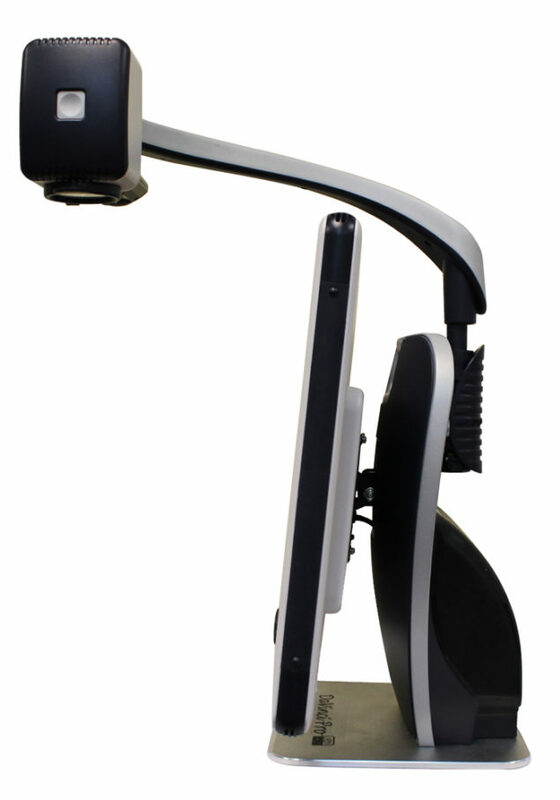 DaVinci Pro HD OCR is an easy-to-use CCTV video magnifier with both a High Definition (HD) camera providing super sharp image quality, plus a built-in text-to-speech OCR reader. If you are considering a CCTV, you must see DaVinci Pro HD OCR . It is amazingly simple, for anyone technologically illiterate, yet expandable, so it stays relevant and useful for years to come. How do you make something great even better….. Just add games! 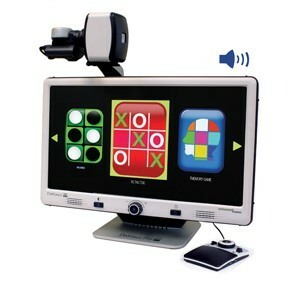 DaVinci Pro HD OCR is the most valuable, most simple, most expandable Video Magnifier CCTV available today. Are your eyes fatigued when you read lots of text? 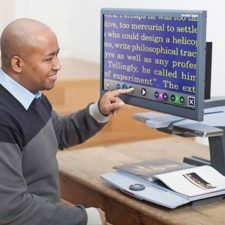 Give your tired eyes a rest with DaVinci Pro’s text-to-speech OCR feature. 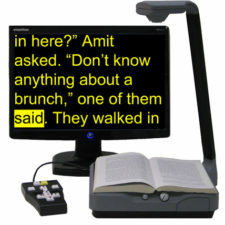 Let DaVinci Pro read your favorite article or book aloud. This is a huge benefit for anyone who wants to read a lot of voluminous print, which is often found in books, newsletters, magazines, etc. 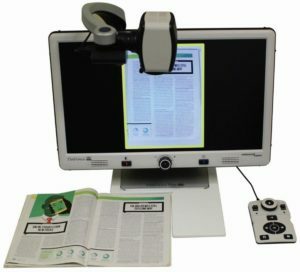 Simply place your printed text under the HD OCR camera and press a button; DaVinci Pro will begin reading what is on the screen within a few seconds. 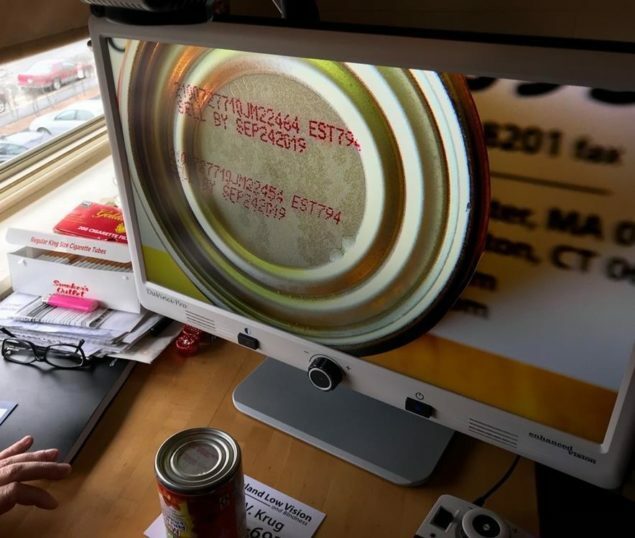 Many CCTV users are senior citizens with Age-Related Macular Degeneration (AMD), who have NO technology experience. 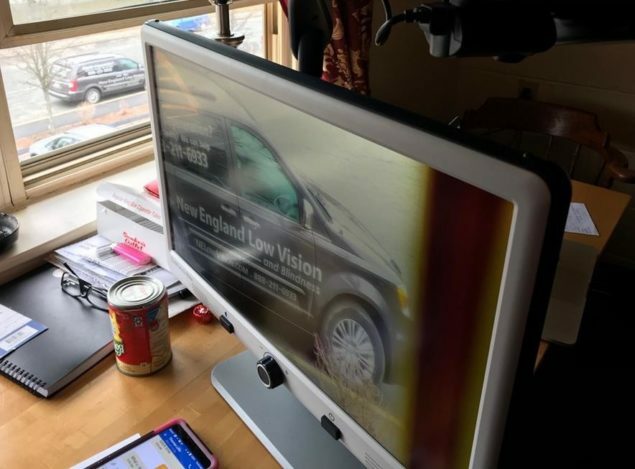 The DaVinci Pro is the most advanced high performance video magnifier CCTV that Enhanced Vision has ever created, and yet it is so easy to use that even the most novice can enjoy it! Set up is easy, just plug in turn it on and begin using immediately. Camera auto focuses on anything you point it at no matter how close or far away. DaVinci Pro even remembers your camera settings for each position. DaVinci Pro is both simple and expandable, meaning it is easy for those who are technologically illiterate, and expandable for the most computer savvy. DaVinci Pro also has advanced features for those who are more technologically savvy to customize it to their own personal preferences. DaVinci Pro has user friendly menus and 28 viewing modes for you to personalize the best contrast and brightness for you. Plus, users enjoy that DaVinci Pro is software-upgradable for Free, so it remains relevant for years after it is purchased. 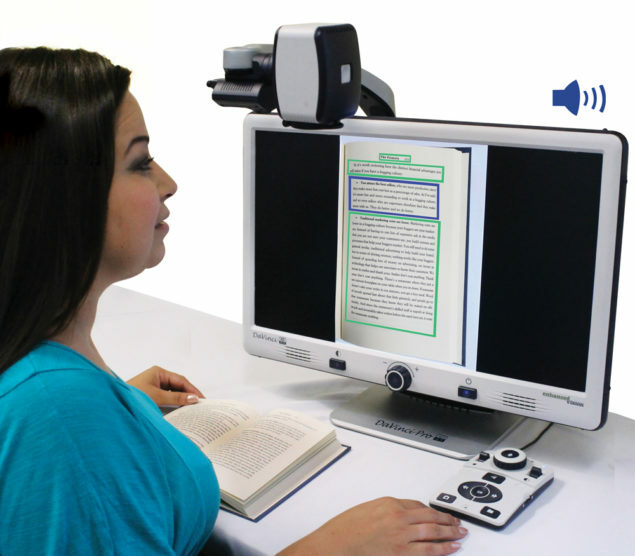 DaVinci Pro HD OCR magnification and text-to-speech features make reading enjoyable again! DaVinci Pro features a SONY Full HD 1080p Camera and a high resolution LCD display that gives you the best image quality with the maximum level of picture details available today! See more detail with brighter colors and sharper contrast. 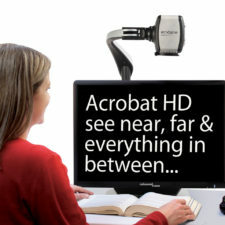 A higher 1080p resolution camera equals improved OCR accuracy. DaVinci Pro HD OCR has a 3-in-1 twistable camera head that rotates 340° allowing you to see three different camera positions: 1) near, 2) distance and 3) self-viewing so you can see near, far and everything in between. 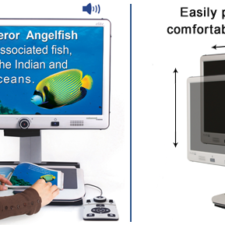 DaVinci Pro’s screen easily pivots to give you comfortable ergonomic viewing positions. 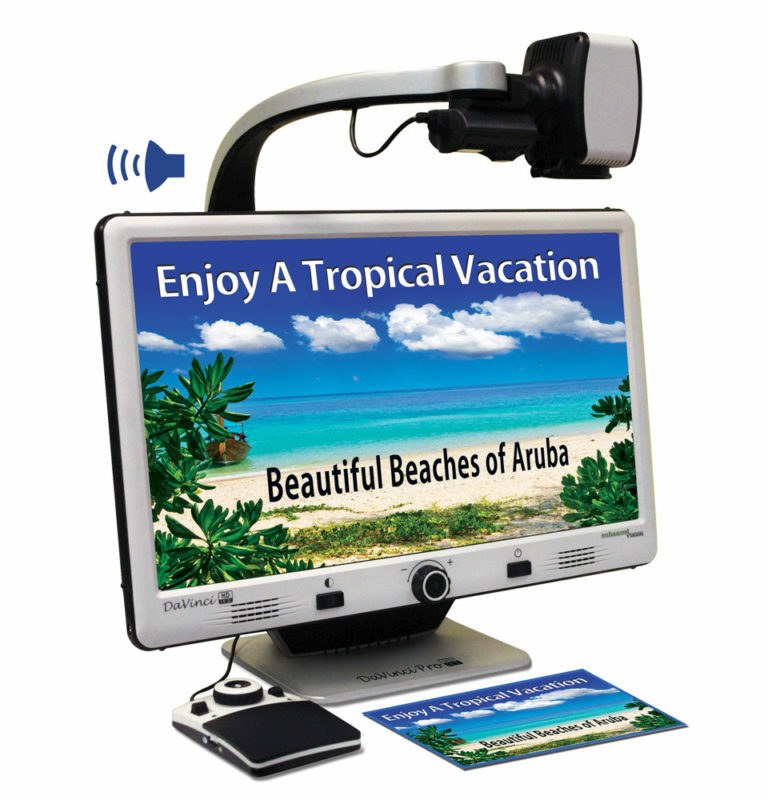 With the HD camera positioned 18″ inches above your desk or table you get the most working space for viewing objects, working on crafts and hobbies. The DaVinci Pro weighs much less than a traditional desktop CCTV, allowing you the flexibility to move it around your home, school or office. 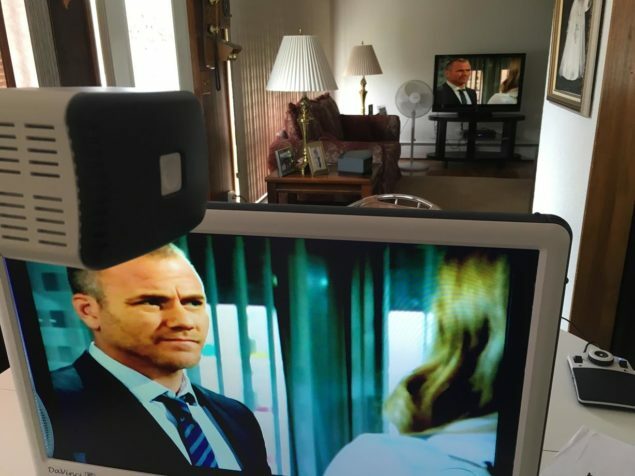 The DaVinci Pro can easily connect to an iPad, iPhone, iPod, PC, tablets just about all your devices to give you expanded viewing options. Technical bulletin of How to Upgrade. Did you know that DaVinci Pro is quieter? As you know, the DaVinci Pro runs a full Windows-based processor that requires a small fan like on any computer. With some minor production modifications and as of March 19, 2018, all DaVinci Pro’s started shipping with a quieter fan that is twice as silent in operation. This is a reminder….Late last year, all DaVinci’s started shipping with a new HDMI option for computer toggle. Previously, the option was only VGA. Now we have both! The XY Table is available for your DaVinci Pro to make your reading experience comfortable. 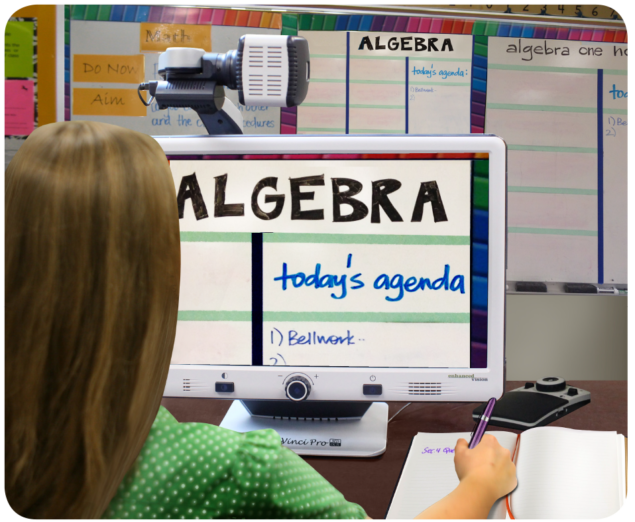 Simply place your reading materials on the XY table and glide the table from side to side and front to back. Helps with both reading and writing tasks. 2 year warranty 13 Mega Pixel Camera for accurate Full Page Text-to-Speech (OCR) Reading preview lets you read the entire page or toggle through paragraphs and read selected text Easy-to-use console with simple and advanced modes Male & Female premium voices Save documents, pictures or books and export files to your PC Apply make-up, shave, read, write, view presentations and whiteboards. 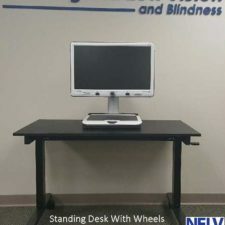 Perfect for work, home, school or college disability room.